Stimulate young minds for less with these discounted children's books. When it comes to unleashing kids creativity, there's nothing quite like getting them stuck into a good book. And right now, these cracking early Black Friday deals offer great savings on some of the most popular children's books around. So if you're looking for ways to stimulate young minds and encourage creative thinking, this brilliant kid's books will do just that. And they come just in time to make the perfect stocking filler or Christmas gift for kids. Save 54% - Celebrate the 60th anniversary of Paddington, everyone's favourite bear, with this brand new classic picture book. Join Paddington and Mr Gruber as they head to London on a special outing to St Paul’s Cathedral, where there is one surprise after another. Suitable for age 2 and up. Save 45% - Another entry for the die-hard Paddington fans among us. 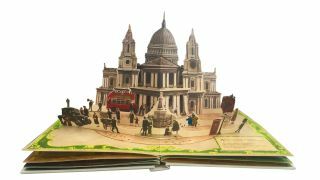 This beautiful collectors edition hardback contains six stunning illustrated pop-up scenes, all taken directly from the blockbuster movie. Suitable for age 3-6. Save 60% - Treat your little ones with the wonderful, and very colourful world of David Walliams. Suitable from age 7 and up, this funny feast of all things Walliams will have your tiny humans laughing all the way through Christmas. Save 50% - Need to keep your toddler entertained? Bing's Noisy Day is certain to do the trick. This interactive book featuring 10 sounds is perfect for fans of the hit CBeebies series, Bing. Suitable for age 2-5. Save 43% - Delight your kids with this Jon Klassen's bestselling, multiple award-winning picture book, which tells the story of a bear who's hat has gone. Suitable for age 3-5. Save 40% - The perfect Christmas Eve present, this exquisitely illustrated Christmas story, with words by Delia Huddy and pictures by rising star Emily Sutton, tells the take of an ugly little fir tree that no-one wants to buy, but ends at the centre of a magical Christmas Eve it will never forget. Save 55% - Got a budding developer in your midst? If so, this Coding for Beginners book: Using Python, one of the most popular computer languages.will make the perfect present this Christmas. Suitable for age 8 and up. Save 43% - Forget Kate and Leo. Tell your kids the incredible story of the Titanic with this beautiful book from Joe Fullman. Filled with amazing facts and details giving insights into the "unsinkable" ship, The Story of the Titanic for Children will satisfy even the most curious minds. Save 46% - We challenge you to find a kid who won't enjoy this stunning book of poems from two-time Kate Greenaway Medal-winner Shirley Hughes. In this wonderful collection, Katie and her little brother Olly go out and about, romping through the changing seasons.